Shooting a target from a distance is considered quite a task.While there many talented shooters who can hit distant targets and make it look easy, most of us need a lot of practice plus the necessary hardware and accessories. Fortunately, there is no shortage of aftermarket scopes and sights that one can use to improve their overall shooting accuracy. For today, we’ll be reviewing a reticle green and red dot reflex sight from Ade Advanced Optics. For this Ade Advanced Optics review, we will go in-depth on the Crusader 8 Reticle Green and Red Dot Reflex Sight. Ade Advanced Optics is a company that specializes in firearm accessories such as rifle scopes, rail systems, gunsmithing tools, gemological optics, and many others. The company had its humble beginnings by doing private label production for various manufacturers, clients, and retailers. Due to the quality of their work, Ade has begun receiving requests from customers for high-quality but affordable aftermarket firearm parts and accessories. The company had a rough start but was able to overcome its fair share of challenges by soliciting feedback from both clients and customers. Nowadays, Ade Advanced Optics remains a competitive brand in the shooting, hunting, and outdoors industry by providing quality scopes, sights, and other accessories. Shopping for reflex sights can be a rather daunting task, especially when there are numerous brands and models out there. If you are in the market for a reflex sight that offers a good set of features, durability, and value, then the Ade Advanced Optics Crusader 8 Reticle Green and Red Dot Reflex Sight should be worth checking out. Unlimited eye relief. Water-resistant and shockproof. Parallax corrected. Wide field of view. The Crusader 8 makes use of a solid aluminum body so this is one sight that will last you for quite a while and it should stand up against the toughest conditions. So if you’re going to use your rifle or handgun for hunting and other outdoor activities, you’ll find that this is one tough sight. It’s also waterproof and shock resistant which is never a bad thing. My first impression is that the scope has a fairly solid construction. The material is aluminum so it offers good protection although it does add a weighty feel to the sight but far from being called heavy. However, it does feel a little bit on the bulky side. The mount also feels sturdy and is a breeze to adjust. Overall, the construction of the Crusader 8 manages to impress. For some reason, this particular sight reminds me of an EOTech that I used to have which trust me, is never a bad comparison to have. As mentioned, this reflex sight is easy to mount. It’s worth mentioning that the mount screws have to be tightened over time and the mounting position needs to be 1 or 2 degrees off the rail center. In terms of mounting, there’s nothing else that I would lose sleep over. As with many off-brand reflex sight that I have bought on Amazon, the Crusader 8 has adjustment screws that are a bit gritty. However, that’s not something that a few drops of gun oil and WD-40 can’t fix. Otherwise, you will feel that the screws give off a very tight feel which is very apparent when you are adjusting the sights. Also, the screw heads are 3mm hex so do yourself a favor and get a bit driver for making adjustments. Operating the sights is about as easy as it gets. There’s a button for green and another one for red – it’s as simple as that. To dim the dot, you only need to click once and you can do this up to 5 times. After the fifth adjustment, the brightness cycles back to the brightest. Turning off the dot is also very easy and is done by simply holding down the button for 3 seconds. The QD system is also adjustable and fits nicely on the rail system. Just pull the lever and lift – again, very simple. Overall, this is a no-nonsense and easy-to-use reflex sight that should be great even for those who has yet to shoot their first bullet. One of the most noteworthy features of the Crusader 8 is the inclusion of the 8 types of reticles. These reticles vary from functional, gimmicky, and downright useless. For the most part, I’ve only used the red and green dots. On the fun side, there’s an ace of spades dial which you can probably show off to your friends but is hardly useful. Then on the useless end, the skull reticle which is just ridiculous and useless for any real shooting. Out of the box, the sight image is a bit canted and fuzzy. However, that’s easily fixed when I wore my shooting glasses. Now, I can simply chalk it up to my middle-aged eyes but there seem to be many users who have noted the canted imaging of the sights. Both the red and green colors are very crisp, especially during daylight. Although I feel that it could probably use one more notch on its brightness setting. In terms of performance, I am happy to report that the Crusader 8 did a decent job. All the reticle shot quite close to the target. I fired at 100 yards and it shot extremely well with my 5.56mm rifle, although I have to admit that it’s a fairly new build, so I can’t exactly gauge how capable it is accuracy wise. After shooting about 200 rounds, the sight held in zero until the last round was spent and after removal. From the looks of it, the sight should be able to hold zero even after several hundreds of rounds. At the end of the day, I am really quite pleased with the Crusader 8’s performance, especially considering the price. 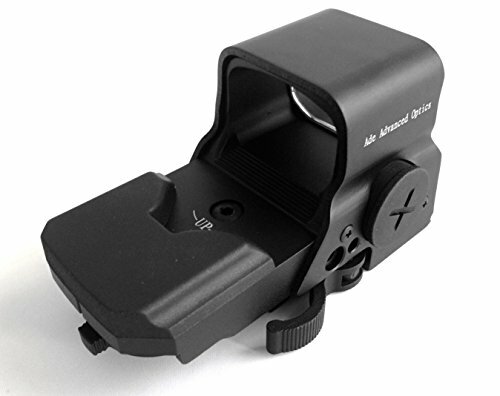 The Ade Advanced Optics Crusader 8 Reflex Sight is available in Amazon for about $70. That’s a crazy price if you know how a standard EOTech will cost you. I am quite not ready to put out $400 to $600 for a new EOTech holographic sight, so I settled with the Crusader 8. As it turned out, it’s really not so bad at all and I’ve saved a lot of money. I must admit that the sight is rough around the edges but with some adjustments and smoothing, the Crusader 8 delivered. Surely, it pales in comparison to the quality of an EOTech sight but for an off-brand, I couldn’t be happier. It also comes with a QD mount already, so that’s more savings on your part. Overall, Ade Advanced Optics really brought the value for this reflex sight package. I feel like this is a great option for those who are looking for a good priced sight without sacrificing quality and performance. For a $70 sight, there’s just no way that this is a perfect product. At the top of my head, the Crusader can be a bit heavy and bulky. However, I used it on a 5.56mm rifl​​e so it hardly feels so unwieldy. I can imagine that it would be too big or heavy when mounted on a pistol. In addition, I like the concept of having rechargeable batteries but the lithium ones that came with the unit leave a lot to be desired. Instead, find a good set of Duracell or Energizer batteries to replace the stock. Another thing I’ve noticed is the gritty feel of the adjustment screws. This is understandable due to mass production and the price but it just feels so rough. Again, this is easily fixed with some oil and WD-40. It’s also not the most polished and finished sight, especially when compared to some EOTech products. For this, I painted the sight to better match the gun. Easy! So how does the Crusader 8 fare with other buyers? As of this writing, the Crusader 8 has a rating of 4.0 out of 5 stars, with 151 reviews on Amazon. So it’s safe to say that it has a fairly good rating and with a bit of popularity too. On the positive side, many reviewers think that the sight feels solidly constructed and durable. Taking into account the price, many are surprised that the product feels high quality instead of flimsy. There are also many reviewers who find it convenient that it comes with its own rechargeable batteries. Unlike yours truly, many of them didn’t find any problems with the batteries. Many users also praise the sight for being easy to mount and operate. Many of them are total beginners, so they appreciate that the sight is fairly simple to operate. There are also a number of reviewers that commented on the performance of the sight. The majority reviewed that the sight work very well and they had little to no difficulty zeroing the sight. Lastly, almost all the positive reviews state the Crusader 8 is a great back for the buck reflex sight. Many users didn’t have that much expectation but were in the end, were pleasantly surprised. On the other hand, many find this sight to be such a disappointment. One of the more common complaints is about the weight and size of the sight. Many of them agree that it’s a well-built unit but it feels rather large and heavy. I guess this really depends on the type of gun used for mounting. There are also reviewers who find many of the reticle types useless and only serves to confuse the users. Many of the reviews also state the rechargeable batteries don’t work or they hardly last. Apparently, many reviewers also share my sentiment against the blurry sight imaging. While I didn’t have any trouble zeroing the sight, there are many buyers who never had a positive experience. There’s one reviewer who didn’t manage to zero the sight regardless of adjustments. It seems that majority of the negative reviews were made because of lemon units. I’ve been doing some reading and it seems that many of the complaints were addressed by Ade by sending replacements. Despite lacking polish and being rough around the edges, the Ade Advanced Optics Crusader 8 Reflex Sight brought in some surprises, mostly good ones. For around $70, you’ll be hard-pressed to find a reflex sight that offers a good balance of performance and value. Aside from some clarity and smoothing issues, this is one of the best off-brand reflex sights I’ve used. No, it won’t compare to high-end sights like EOTech but this is a good compromise considering the price. What do you think of the Crusader 8 sight? Are you compelled to give this sight a try? Feel free to share your thoughts in the comments! Previous articleThe Latest Vortex Strike Eagle Review Has Finally Been Revealed! Next articleSwarovski Scopes Review – Is the Swarovski Z3 Worth the Money?